What’s everyone’s plans for tonight? Anyone going out with kids for trick or treating? Got a Halloween party you’re going to? What are you dressing up as? I’ve always liked dressing up for Halloween and although I haven’t gotten to do it very often, I still have some ‘Wish-List’ costumes that I’d love to be able to do someday. 1) A 20’s flapper is definitely something I’d like to be- with the bobbed hair, flashy dress and pearls to go with it. 2) I’d LOVE to dress up in a fancy Venetian Masquerade ballgown and mask, with an elegant hairdo. 3) I’d love to be Harley Quinn, as long as I could have a guy go with me as the Joker. 4) One of the “Grease” Pink Ladies. 5) Black Widow- because that cat suit Scarlett Johannson wore in “The Avengers” was everything. 7) If I ever get a boyfriend, I am GOING to be Christine and make him dress up as the Phantom of the Opera. He will have absolutely no choice or say in the matter. It’s a prerequisite if he wants to date me. Unfortunately, I’m not doing anything special in particular like dressing up or going to any parties. But I am staying in my kitchen- which is plenty ‘special’ enough for me. I’ve known for a while now that I was going to make this dish for Halloween. Cinnamon rolls have been on my Cooking Bucket List for a while, and I had a can of pumpkin that was languishing in my pantry, without very much to do. That set the perfect stage for Pumpkin Cinnamon Rolls. It was my first time making cinnamon rolls, and I think they turned out pretty good for a beginner like moi. I walked away with a few things to keep in mind for next time: roll the dough VERY tight so the sugar filling doesn’t leak out while the dough is going through their second rise, and don’t be afraid to place them pretty close together in the pan so that they can rise higher up rather than further out. Aside from all that, the taste is really spot on for these. For one, they make your house smell like every yummy Autumn pastry imaginable while they’re baking. The pumpkin flavor admittedly isn’t very overpowering, but I’m actually okay with that as sometimes the taste of pumpkin can be a little abrasive. I know that crystallized ginger isn’t the cheapest spice to buy, but if you can afford it I gotta strongly recommend that you don’t leave it out. It gives spiciness to the filling that balances the sweetness of the sugar, while the dried cherries give it an acidic tang. I iced my rolls almost as soon as they came out of the oven so that the icing would melt into the crevices of the dough rather than just sit on top of it in thick globs. Tastes better that way. Also, these save very well in the refrigerator; when ready to eat another one just wrap it in paper towel, sprinkle with a few drops of water then microwave for about 15-20 seconds. It’ll still taste pretty fresh. These rolls are going to this week’s Fiesta Friday #40, hosted by Angie@TheNoviceGardener and co-hosted this week by Margy @La Petite Casserole and Jhuls @The Not So Creative Cook. See you all there. Halloween is one of my absolute favorite times of year, but not for the reason that you may think. It’s not that I don’t like dressing up in costumes. I do. It’s not that I don’t like candy. I definitely do. But the arrival of Halloween marks the arrival of something infinitely more thrilling and exciting for me than costumes or sweets (and if you know me, then you know that that’s really saying something). I look forward to October 31st because it marks the final day before I officially begin my countdown to Christmas. Me and my twin sister are obsessed with Christmas, and as such, we try to get in our Holiday spirit as soon as is reasonably possible. I know that other people wait until Thanksgiving, but that’s way too late for me. I like the extra month to start listening to my Christmas playlist on my mp3 player and Pandora radio stations, and start planning all the wonderful goodies that I’m going to make for the 12 Days of Christmas series on Cooking Is My Sport. Time: 3 hrs 25 mins. to 5 hrs 10 mins. 1) Mix and knead all of the dough ingredients together — by hand, mixer, or bread machine — until you’ve made a soft, fairly smooth dough. 2) Place the dough in a lightly greased bowl, cover the bowl, and allow the dough to rise for 1 1/2 hours, until it’s almost doubled in bulk. 3) Turn the dough out onto a lightly greased surface. Roll it into a 14″ x 22″ rectangle; the dough will be thin. 4) Mix the cinnamon and sugar. Spread a thin layer over the dough, leaving one short edge free of filling. 5) Sprinkle with crystallized ginger or dried fruit (or both), if desired. 6) Starting with the short end that’s covered with filling, roll the dough into a log. 7) Cut the log into nine 1 ½”-thick rolls. 8) Place the rolls into a lightly greased 9″ x 9″ pan that’s at least 2″ deep. Set aside, covered, to rise for 1 hour, or until the rolls look puffy. 9) Bake the rolls in a preheated 375°F oven for 25 to 30 minutes, until they’re lightly browned and feel set. (Internal temp should be about 185-190 degrees F) Remove them from the oven, and set them on a rack. 10) To make the glaze: Heat the butter and milk together till the butter melts. Whisk into the sugar. Ahhhh!! So good! Heck ya you are going to get a BF…and he will be lucky, lucky man! Oh yay!! Haha!! Me too!!! Katie and I LOVE Christmas!! We were actually talking the other day that we’re hoping tomorrow, November 1st, that a couple of our radio stations in Buffalo start playing Christmas music!! It’s always a competition between them to see who can start playing first, and I have a feeling this year, tomorrow is the day!! These pumpkin rolls look so SO delicious Jess! Yum. I’m freaking making them tonight. First, it will help me to forget that it’s Halloween, so I won’t be too scared tonight…. and second, because Katie and I are heading to the farmer’s market first thing in the morning, and wouldn’t they be perfect for the ride? Love this. ❤ We'll just hang out in our kitchens together tonight. Hmm… 12 days of Christmas. Brilliant. I have been looking for a good bourbon ball recipe. Or maybe a breakfast casserole of sorts, something different from the norm…for Christmas morning? 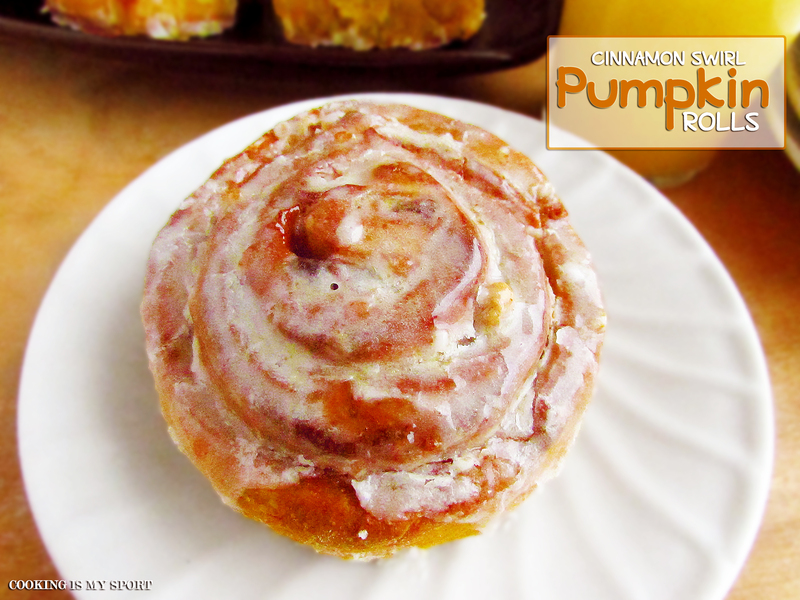 Pumpkin Cinnamon Rolls are on my bucket list, too! Yours look amazing. You would never know you hadn’t made them before. Thank you for the tips. I love Christmas music, too, and can’t wait to start listening to it. What is your favorite Christmas song? I feel the same way, Jess! The 1st day of November is when I start counting down to Christmas! And it’s also around then that they begin playing Christmas movies and if there’s anything I’m obsessed with, it’s Christmas movies. 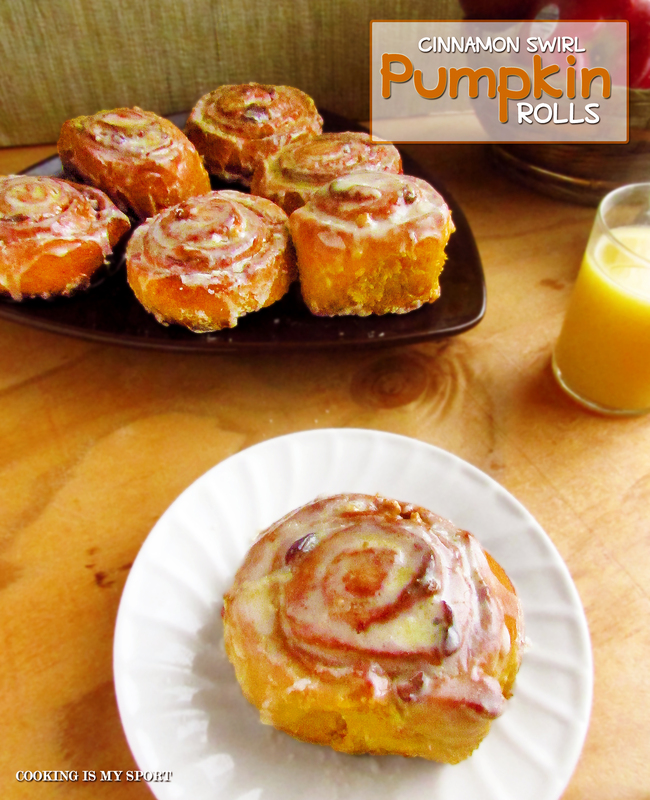 These cinnamon swirl pumpkin rolls look great! I love cinnamon swirl rolls in general, especially the ones at Cinnabon. But pumpkin? Genius! They looks so yummy – I’d never thought you could use pumpkins for a sweet treat like this! I just need to move in with you. Your baking is crazy amazing. I need to have a Jess Pinterest board. Well, you say you are a beginner but these are perfect a professional baker couldn’t do it better. Just gorgeous Jess. 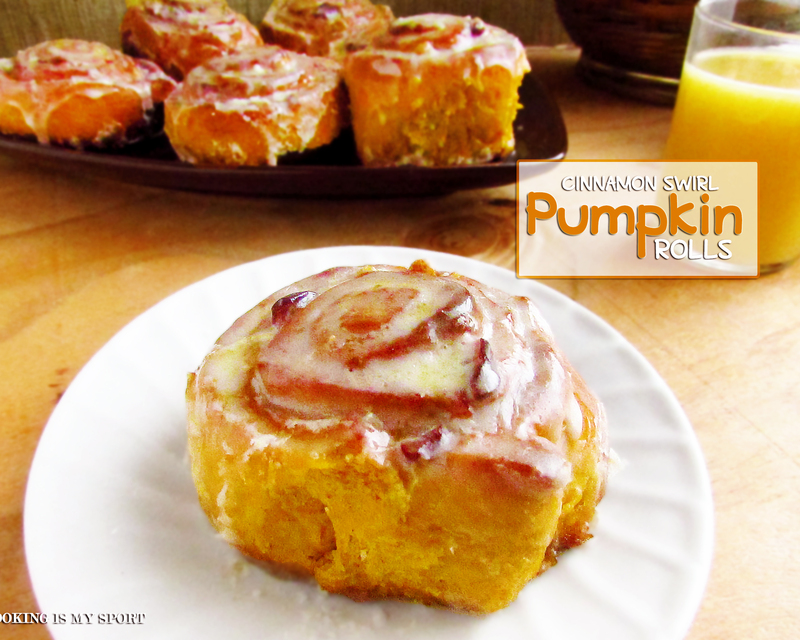 I am crazy about cinnamon rolls and pumpkin, these are on my short list. You should make Buche de Noel. Its so festive and beautiful and you are a great baker. These look like they were made very a veteran of cinnamon roll making, i could definitely eat up a fair few! I want one of these RIGHT now!! Hope you had a great Halloween! I’m sorry I’m late. Since Halloween was 2 days ago (I hope you had a lot of fun!) would be more appropriate start speaking seriously of Christmas??? The only condition I want to impose is to have however some of your pumpkin rolls. I quite new to bake and to have dessert with pumpkin (in Italy we’re not so used to use this ingredients for sweet food) but I have to admit that I really love the flavour that pumpkin gives to cakes, biscuits and so on. Thanks a lot for being at FF, it’s very much appreciated! Looks scrumptious, Jess. Love your addition of pumpkin! Ironically, my next post is cinnamon rolls…if I can ever can the darn thing done. Must be the crisp autumn air getting us to bake! A great twist to the humble cinnamon rolls 🙂 looks very yummy! Oh. My. Goodness. These rolls are making my mouth drool as I look at them on my computer screen! What a great way of incorporating pumpkin into baking. These are totally unique! I’m bookmarking this page 🙂 P.S. I’ve always wanted to do the flapper costume as well lol. Fiesta Friday is wonderful for finding new blogs- thank you! Yum! These look too good!